Finally, one week after its arrival, I get to put my hands on the long awaited thermocirculator. Since I had friends visiting, I decided to play safe and try something simple. I created a quick and easy recipe pulling elements from various books. I followed Thomas Keller's directions for the cooking of the lobster tail, except instead of putting the whole thermocirculator into a bath of beurre monte'(that would be a bit too expensive for a one-off! 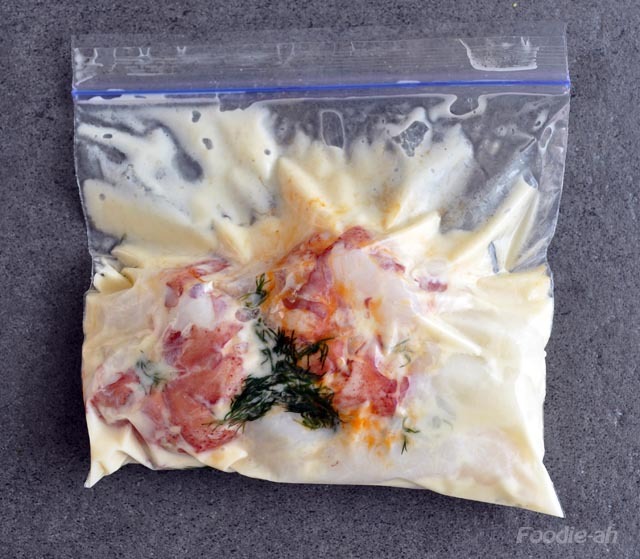 ), I made a small portion of beurre monte'and put it into the bag with the lobster tail. I also added some dill from my garden for extra flavour, and cooked the tail for 15 minutes at 59.5C. This resulted in a firm but creamy texture. I then refrigerated the tails as I decided to serve them cold. For the fennel, I based the timing on Thomas Keller's: 75 minutes at 85C. The only inconvenience was that the circulator pump stopped at about 45-50 minutes, and basically the cooking process became unreliable from then onwards. I then learnt that at such high temperature, the Sous-vide professional can't cope and eventually fails. After several experiments, I came to the conclusion that the only way to make it work reliably (without placing it in an air conditioned environment, which is a bit silly), is to place a decently powerful fan blowing into the device. Well, next time I'll know. The fennel was a bit undercooked as compared to what I did the previous day, but still nice. I then quickly browned it on each side on a frying pan before serving. The other struggle was due to the fact that I don't have a vacuum packer and I have been sealing the bags in water. 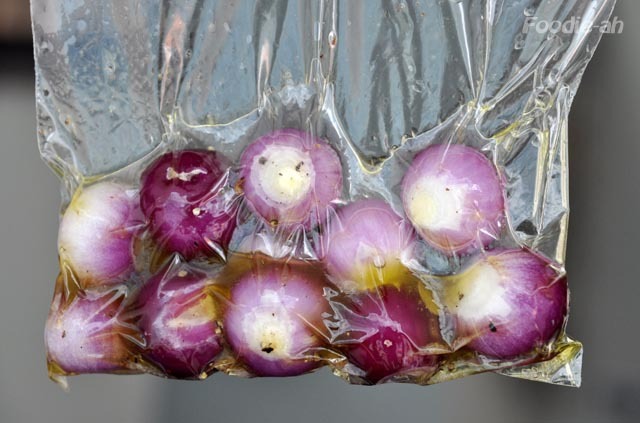 This technique works perfectly with meats and seafood or anything heavy, but when you deal with vegetables, you definitely end up with air bubbles that blow within the pack once you place it into the hot bath, bringing your carefully sealed vegetables floating on the surface. this is really something you don't want, since the temperature will not be evenly distributed. 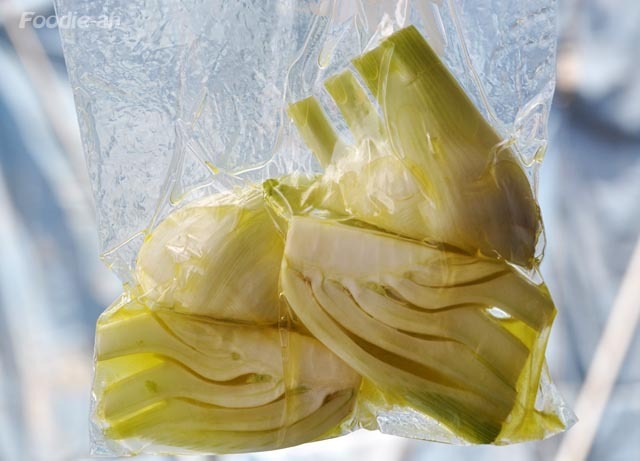 I am planning to cook more vegetables sous-vide, so I will buy a vacuum packer. The onions were cooked together with the fennel, and they were also slightly undercooked. They seem to require about the same timing as the fennel for proper cooking. I made the lobster sauce with 1/2 cup of buttermilk, 2 tablespoons of sour cream, salt and about 15 fresh green peppercorns. I whisked it until emulsified and let it rest in the fridge. I only served the foam on top of each lobster tail. 85C for 75 minutes is a high temperature which tends to overheat my circulator (on sous-vide professional machines). The usage of a fan pointing onto the device resolves the problem. 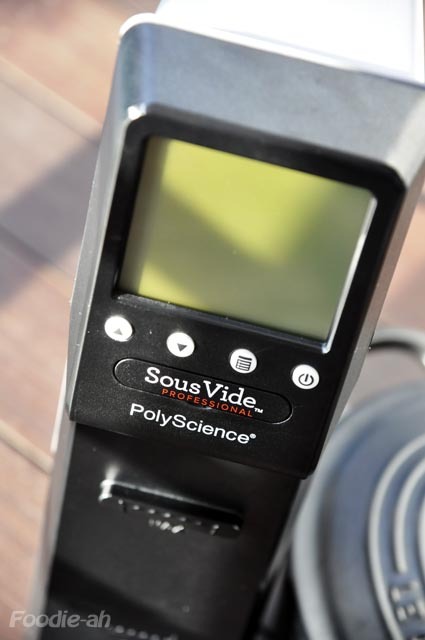 According to Polyscience, my unit is defective and they are now replacing it free of charge! Overall, I must say that on my first experience with this cooking technique I had a lot of fun. There are hurdles that you need to resolve and learn how to deal with, since this is different than conventional cooking, but this is also what makes it attractive. The thought that once you learn', it is perfectly repeatable, makes me think of the day that I will be able to sit and relax while the meat is braising! 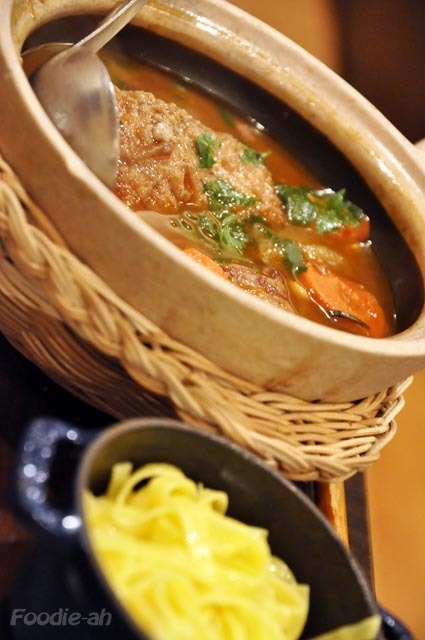 Located on the 8th floor of Orchard Central, Ootoya proposes a range of simple Japanese classics, just like in Japan. This is in fact a branch of a Japanese Franchise that is well known in its home country. The first thing you'll notice is that unlike most other businesses in Orchard Central, Ootoya is packed most of the time, with a queue of people waiting outside the shop. That makes you wonder how good it is, considering that the mall isn't busy and other restaurants are struggling. The restaurant is structured a bit like a traditional Japanese tatami room with a U shaped table following the perimeter, such that guests can go around the table and eat on each side of it. It's a Japanese concept to optimise space and make eating more social. I only tried a few of the dishes out of a fairly comprehensive menu. The homemade tofu was pretty good, in the sense that it's unique for Singapore. 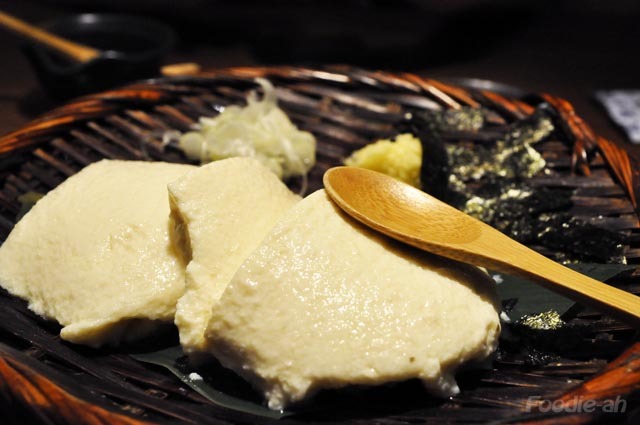 The texture is quite grainy and not as smooth as most of the tofu served on this island, which makes it more interesting, although not nearly as creamy as some of the tofu I had in Japan. 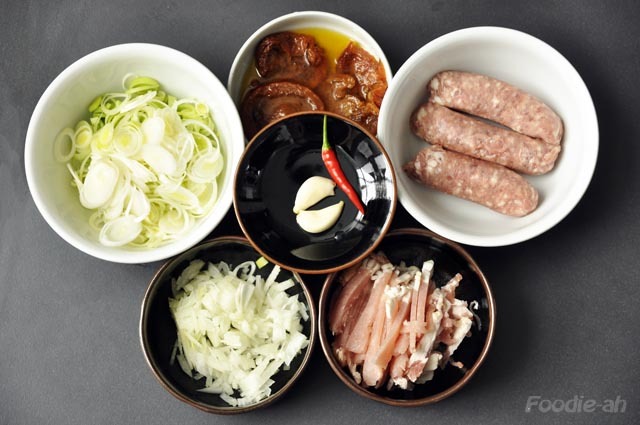 The buta-kimchi is a Japanese version of the Korean kimchi-bokum, quite modified for the Japanese palate, with a rounder and sweeter flavour. 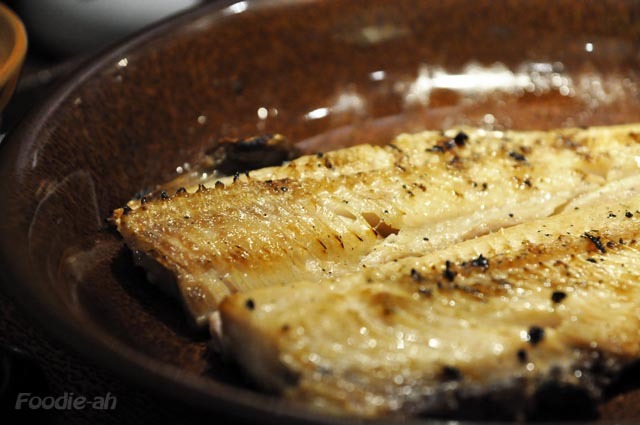 The Charcoal Grilled Atka Mackerel is my favourite. The meat appears dry on the surface, but extremely juicy inside, but the best part of it is the grilled skin. 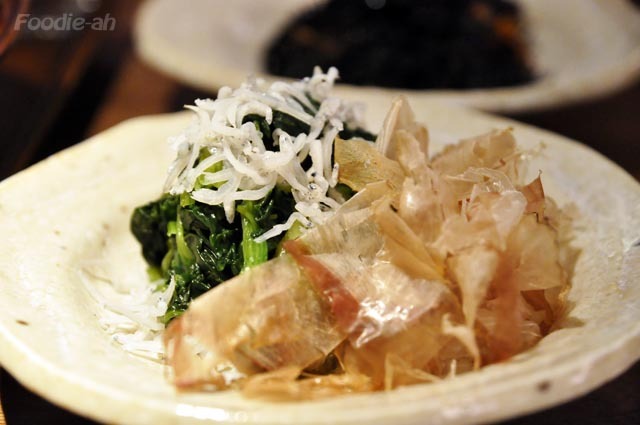 The charcoal flavour is so intense that you really can't resist it, especially when you pair it with Japanese rice. Ootoya is overall good value for money. 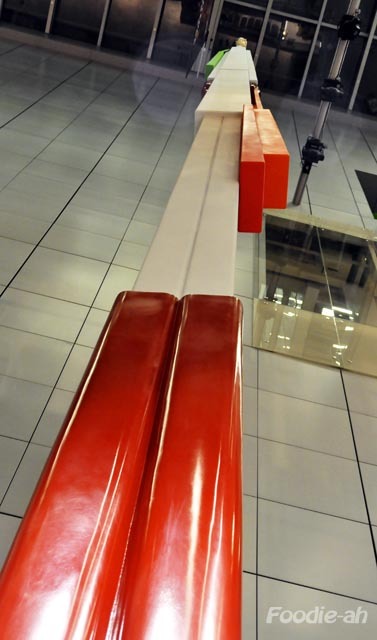 The queue is annoying, so I always go late (after 9), when I can get a seat straight away. 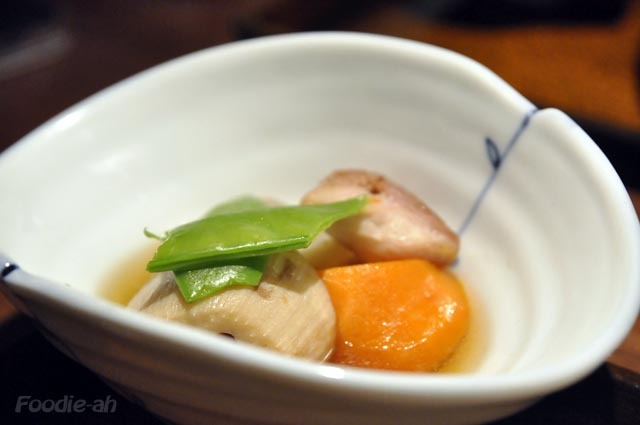 The service is good enough, and the food is well priced and well executed, for a "fast-food" type of restaurant that is more or less on the same price range as Waraku and other similar chains, but delivers incomparably better food. On the other end of the spectrum, the leading edge technology of modern gastronomy: a Polyscience Sous-vide immersion thermal circulator. It looks like a network storage solution more than a kitchen accessory. Digitally beautiful, it would disorient your grandmother, and perhaps even your mother. What can you cook with it? 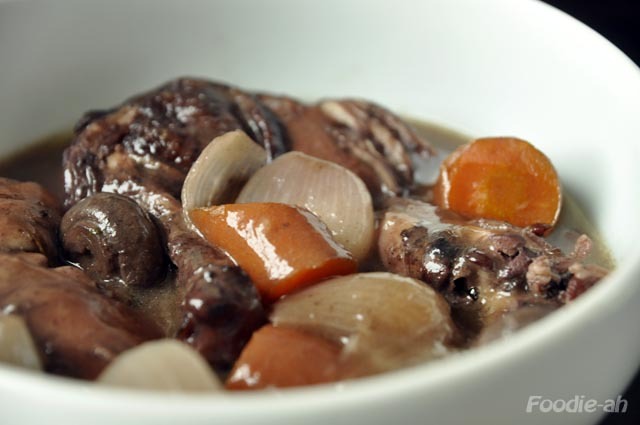 You can indeed revisit classics such as coq au vin or beef Bourguignon, but its strength is certainly fine dining and the ability to produce meats and vegetables with unprecedented textures and flavours. Is this going to take over everyone's kitchen within the next 20 years? Perhaps. 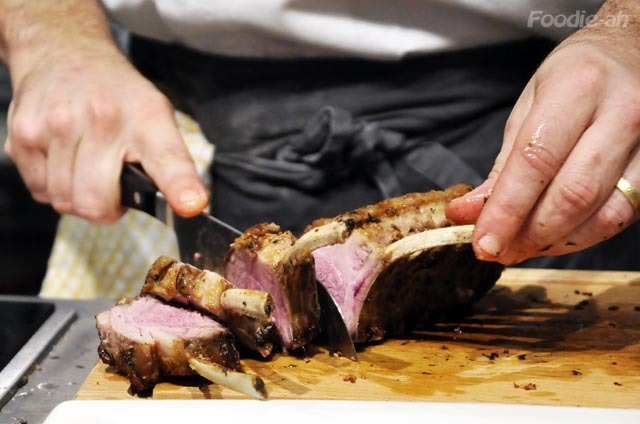 The natural question is - what will be the next generation cooking tool, after sous-vide circulators? What will make such a tool look like a thing of the past? Maybe this blog won't live long enough to answer that. This time I decided to prepare a quick and simple tomato sauce, and invest more time on the actual pasta. 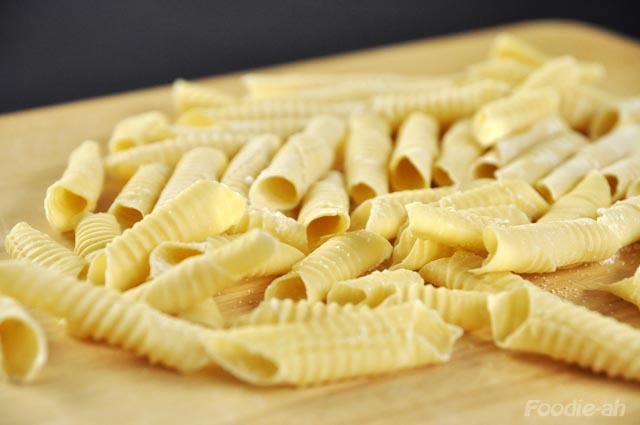 Since we are on the topic, many believe that homemade pasta is always better than dried pasta. It is actually not how we see it in Italy. The choice of pasta depends on the sauce that you pair with it. Certain sauces go well with fresh pasta, while others would only really work with dried pasta. 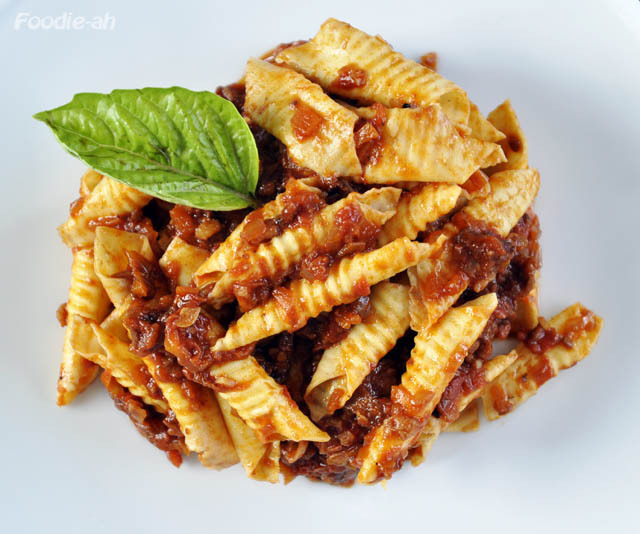 Bacon and tomato sauce is a classic example that pairs perfectly with fresh pasta, especially when it is riveted or hollow, so that the tasty sauce sticks particularly well. It is very easy to make and can hardly go wrong! This time I decided to experiment a bit with my digital camera, so I shot a video of the key parts of the preparation process. Hopefully this helps! For the fresh pasta, please follow the instructions as shown on the video. Depending on the size of the eggs, you will need to add additional egg white should the consistency be too hard and dry for kneading comfortably. When the dough is smooth, wrap it in cling film and let it rest in the fridge for at least 1 hour. In the meantime, start preparing the sauce. 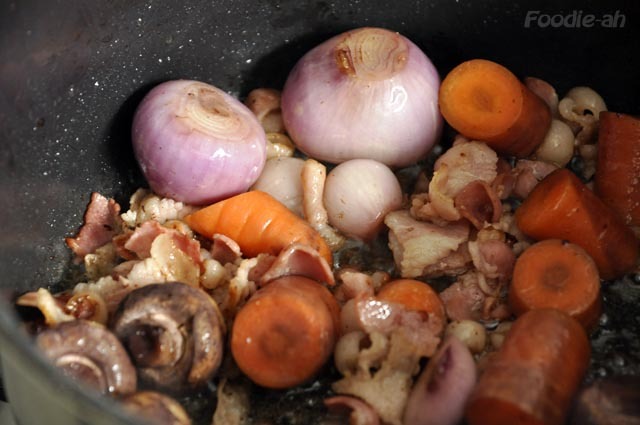 Chop bacon, garlic, onions and carrots. 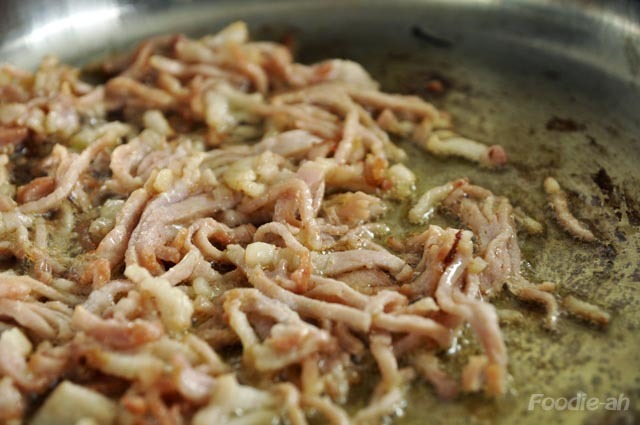 On a frying pan, bring some olive oil to the heat and fry the bacon until golden. Remove it, then fry the onions and garlic for a couple of minutes and add the carrots. 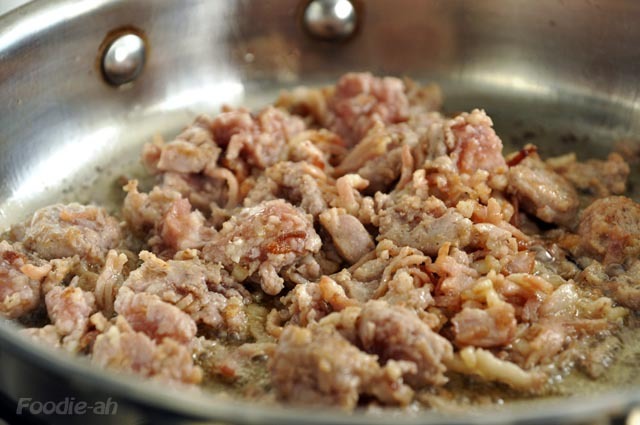 Continue to fry until soft and well browned, then remove from the pan. 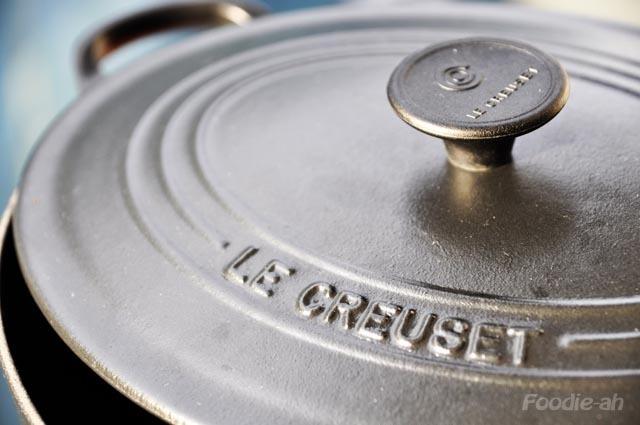 Deglaze the pan on high heat with a glass of red wine and reduce to a half. Then add the bacon back into the pan, followed by the chopped onions and carrots. When bubbling, add the plum tomatoes and rapidly chop them while tossing. Add the herbs and salt as necessary, then slowly continue to cook over very low heat. Remove the dough from the fridge, and bit by bit flatten into sheets. Once a sheet is flattened, cut it into 3x3cm squares, and roll around a chopstick. Gently press and roll the ends of the chopstick onto a sushi bamboo mat to rivet the Garganelli, then place each piece aside. Do not overlap pieces on top of each other, or they will flatten. In the meantime, the sauce should be ready. 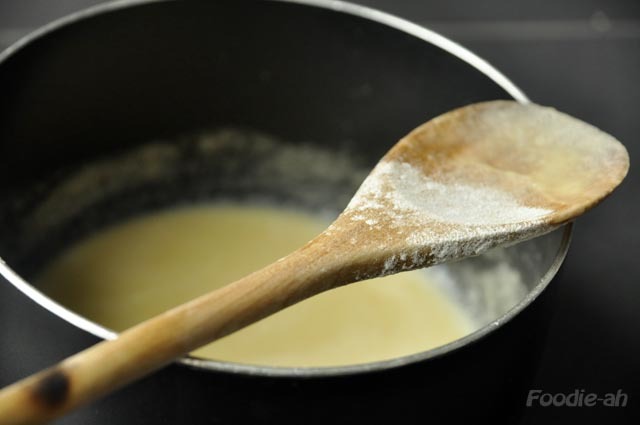 Add some water or milk if you need to prolong the cooking time and it gets too dry. Grate some Pecorino cheese, remove the sauce from the heat and mix it into it. Cover and let it rest. 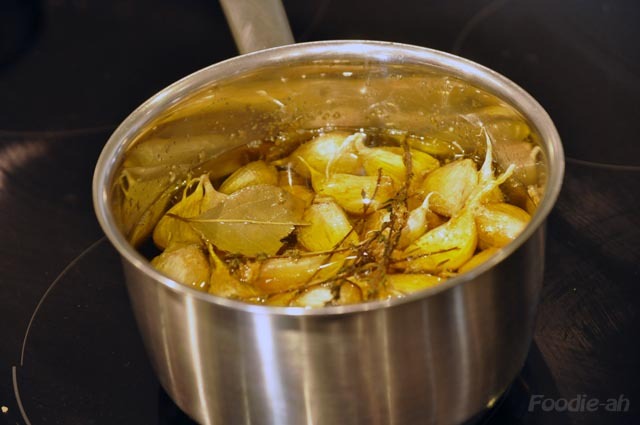 Boil some water in a large saucepan, salt it and put the Garganelli into it. Let them cook for less than 2 minutes, then drain and mix them into an appropriate amount of sauce. Plate and serve hot. 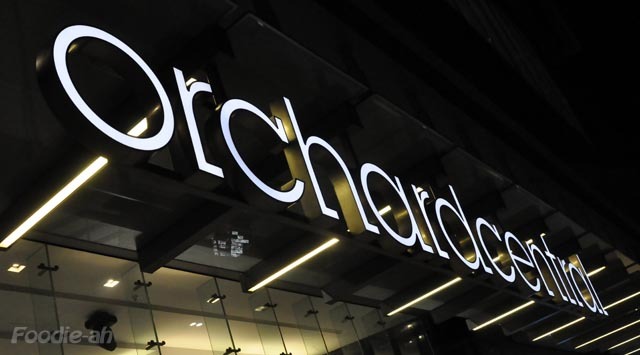 I would like to question the recurring theme of Orchard central being a Far East Organisation fiasco due to "bad design". It is no mystery that the shopping mall has not been doing well. It is deserted even at peak times, and its businesses are struggling. Fortunately, many of the restaurants are surviving well, although some have good potential and would deserve to do better. Next door, 313 was completed shortly after, and yet it enjoys an incredible flow of shoppers buzzing at any time of the day. How can this be explained? What went so terribly wrong? It is hard to counter-argue that the long winded car park is unfriendly and challenging to drive through, and they could have definitely done a better job at encouraging parking within the mall. However, the car park alone can't be the reason why Orchard Central is deserted, and I would question the other couple of points. Singapore is considered a shoppers paradise. Shopping is not just about going to seek and buy a specific item, although sometimes that may well be why you do it. Shopping is supposed to be entertaining and fun. Shopping is about exploring, experiencing something new and stimulating. Most would agree with these statements, and yet when we hear people's opinions about Orchard Central, the complaint is that it is hard to navigate, it is "easy to get lost in the maze". Come on, how hard can it be? Certainly, it is not as easy as 313, which is designed for hamsters. You don't need to think, you just go up or down the circular levels, pretty much like malls were designed back in the 80's. Yes, you can point and get there, buy and get out at record times and it could be an ideal venue for shopping olympics. That is practical indeed, but also old style and boring. Is this what we are looking for? Just another building with some new shops, out of which 70% exist elsewhere on the island or even Orchard itself? Or are we looking for a bit more stimulation? I would have thought the latter. The shopping centre of this century should provide a space that goes beyond shopping and services. Those who have been to Japan and have visited Tokyo or Osaka, would be quite familiar with interesting layouts when it comes to shopping areas. The underground network of malls is even more intricate, with a web of arteries connecting different levels of shopping malls and subway stations, flooded by a rapid flow of shoppers. A quick look around is sufficient to conclude that shops do well, from the most common photo printer, to the most unusual gadget shop. Another thing you might have noticed about Japanese shopping malls is that some of them do not just provide a shopping experience, they also include recreational space, with outdoor garden and terraced areas where the young can gather in a group or find a quiet corner for a bit of privacy. Malls are not purely a place to "fetch consumer items", they are integral part of city navigation and social activities. The question is why this can't work in Singapore. We are all so eager to shop, and so proud of Singapore as shoppers paradise to entertain visitors. We often complain about how boring, limited and repetitive Singapore is. Should we not be excited when we are gifted with a bit of innovation? I included some pictures shot tonight at the higher floors of the mall. 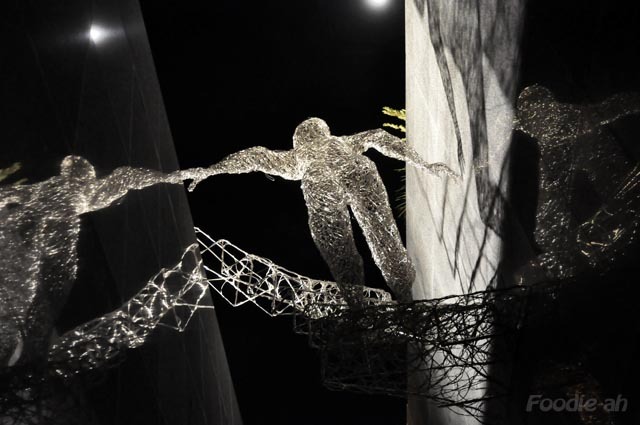 Art is well incorporated into the concept, and entertainment and social areas are provided top to bottom. 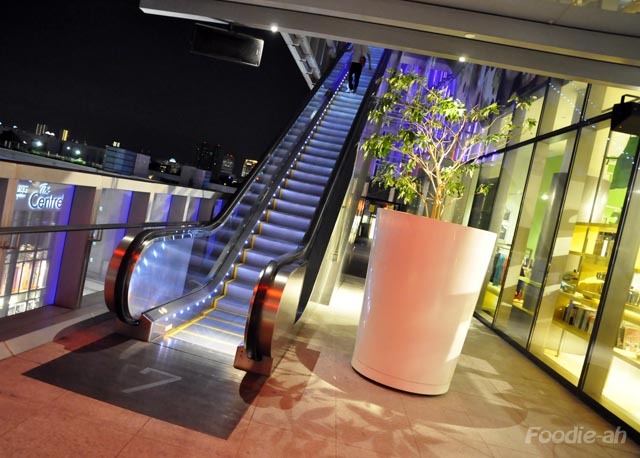 The highest floor includes a unique roof garden with a stunning view over the CBD and Marina. 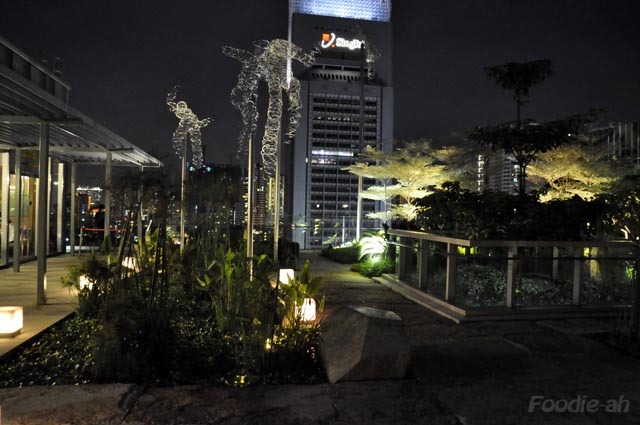 Plants and interesting art pieces are scattered around the area, creating an intriguing space for exploration. 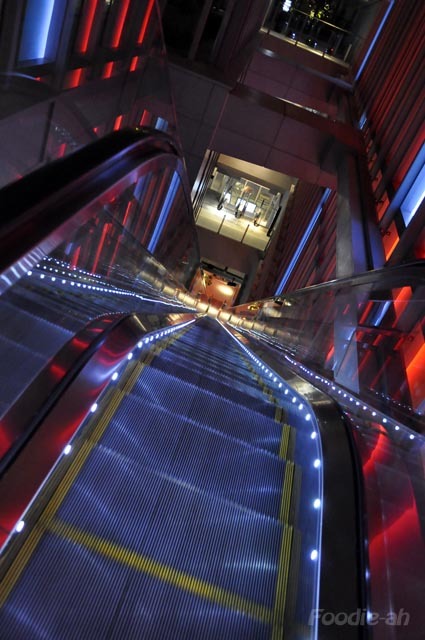 The breathtaking escalator leading to the top is the longest I have ever seen, and its lighting is a work of art (see video at the end of this post). If I ever had to show a mall to impress visitors from abroad, this is where I would take them. So what went wrong? 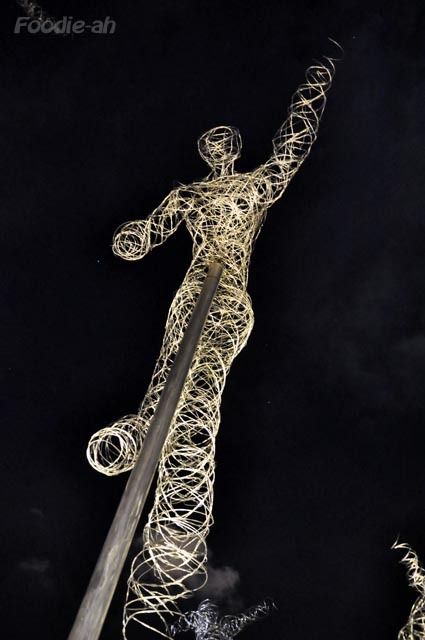 Are we really so rigid and conventional and not ready for a bit of innovation? Are we shutting down creativity? Far East Organisation tried to push the boundaries and they failed. And now we are the ones pointing fingers. Hopefully this won't discourage developers from being inventive and creating malls that go beyond what we already have everywhere else on this island. Patrick Heuberger conducted a cooking presentation at Shermay titled "What the French really eat". 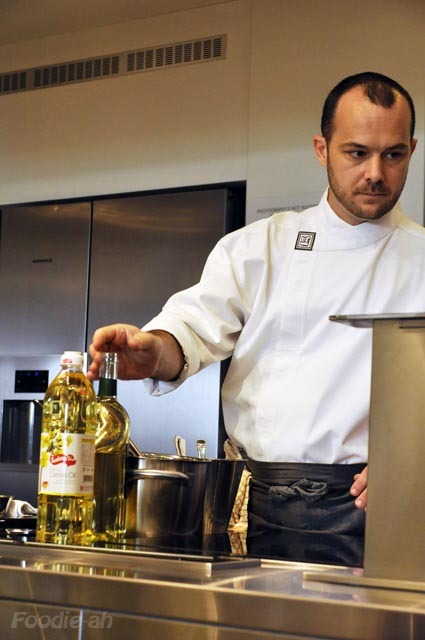 He cooked a selection of some of the dishes he serves in his restaurant, Le Bistrot du Sommelier. The cooking demonstration was extremely smooth, enjoyable and easy to follow. He really made the cooking process look as simple as possible, although behind that simplicity there are years of practice. I would strongly recommend attending some of Partick's presentations to anyone who is interested in classic French cooking, since watching a master at work can really save you a lot of failed attempts. He also conducts a lesson on basic French cooking techniques, which would be a better starting point for those with little cooking experience. Out of the recipes presented, I am planning to try the rabbit, the frogs legs and the tongue. Presentation aside, the end result was superb, just like in his restaurant, and I ate a lot more than I intended.... It's my third French meal in a row this weekend. I think I will take a break for a week or two! This morning I started the day by putting a large portion of my huge basil plants to good use. 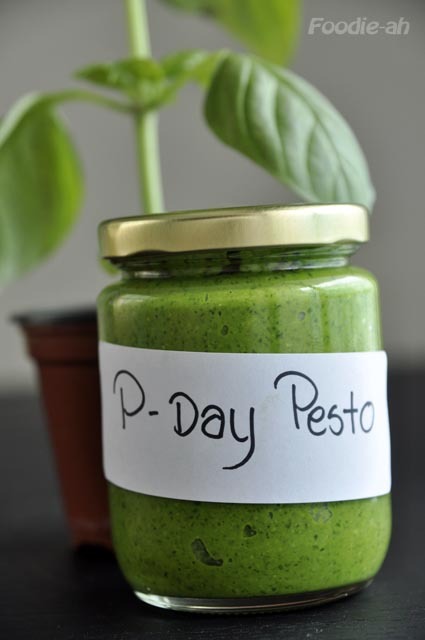 I filled up a very large bowl with pesto leaves, which was reduced into a small jar of pesto I made for my neighbour friends. Lots of basil (you need to grow it, or else it's far too expensive), a tiny amount of garlic, pine nuts, freshly grated black pepper, grated pecorino cheese and Italian extra virgin olive oil. Hopefully they finished it by now, since it doesn't keep its fragrance for very long. 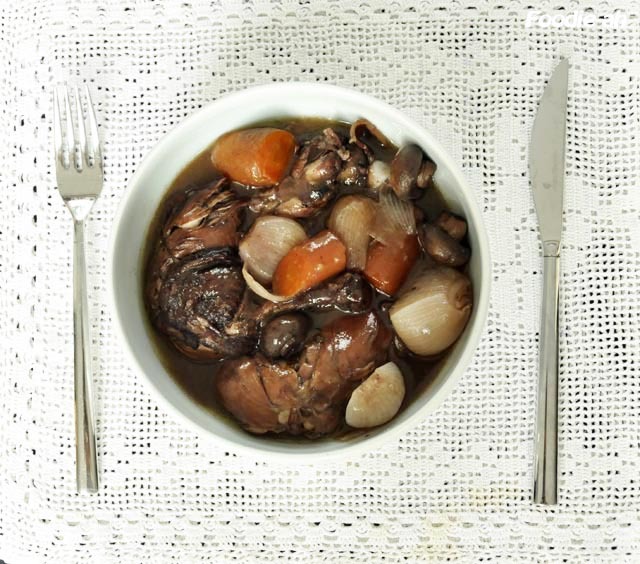 I had a very good coq au vin at Le Bistrot du Sommelier, and decided to experiment with cooking one myself. I was quite impressed with the result, which was not far off what I had in the restaurant. 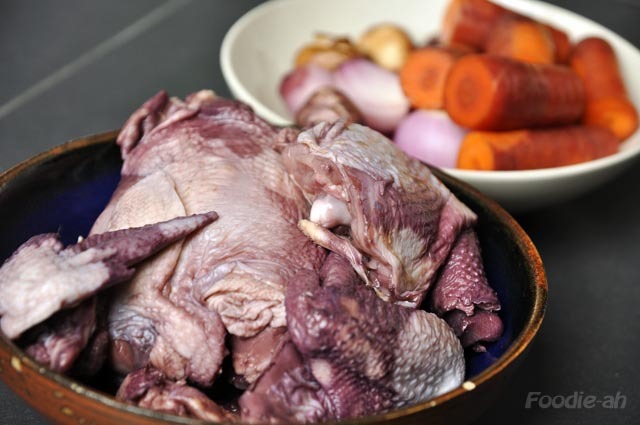 I started by marinating the chicken (cut into a few pieces), onions, garlic, mushrooms and carrots in 1/2 bottle of Pinot Noir. The next day, I removed the chicken and vegetables from the marinade, which I set aside for later use. 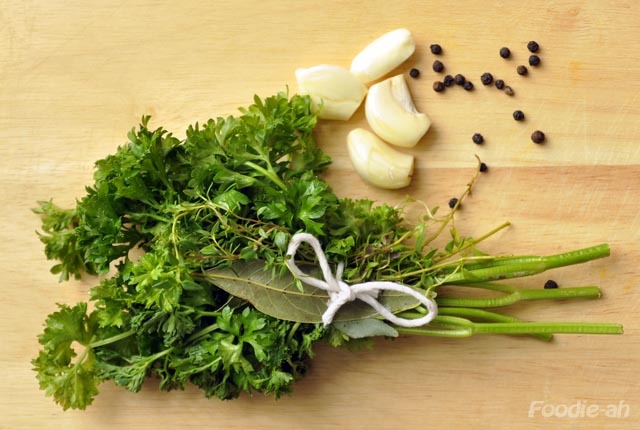 I created a bouquet garni of parsley, bay leaves and thyme from my own garden. I fried the chicken in butter until lightly golden, then I removed it from the pan and I fried the bacon, followed by the shallots, carrots and mushrooms. I then added the chicken back into the pot, and topped it up with the wine marinade, together with 200ml of chicken stock, peppercorns and garlic, and the bouquet garni. I recommend adding some of the salt now, and make the final adjustment towards the end. I cooked it on slow heat for about 1:40 hours. Alternatively, if you have a claypot, you can cook it in the oven for the same amount of time. If you have some brandy, they recommend that before topping up the chicken with the marinade, you cover it with some brandy first, and set it on fire. I didn't have brandy to hand, so I had to skip this step. I made a roux sauce by whisking in some flour into 25g of melted butter over medium heat. Once cooked, I removed the chicken and vegetables and set them aside. I then filtered the sauce through a sieve, and gently simmered it with some of the roux in order to slightly thicken it. Finally I poured a gentle ladle of sauce over chicken and vegetables and enjoyed the rustic dish with plenty of fresh bread! Some time ago, I wrote a post about Quattro Stagioni - an Italian deli that used to be located in the basement of Liang Court. Well, what to my knowledge used to be the only Italian deli in Singapore, is now closed. Although nobody in Liang Court seems to know the reason (according to them, the staff suddenly vanished), I suspect it's due to poor sales. I have been patronising the shop regularly for quite some time, mostly at weekends, and I have rarely seen it busy. 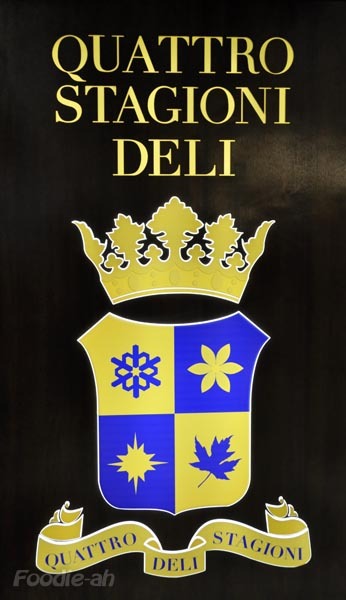 In other words, a specialised Italian deli in Singapore doesn't seem to work. Quattro stagioni used to have the most basic products, forget about an extensive range, but it was a good start. I was delighted that finally I could buy bottarga or good Italian tomatoes, or proper Italian cheeses to complement a meal, including real buffalo mozzarella and burrata. Of course, my expectation would have been that in a few years time there would be more of these shops around the island, carrying a more extensive range of products. Unfortunately, the initiative died prematurely, leaving little room for future development. Why did the concept of an Italian deli not work? Is Singapore not ready for it yet? Is it too small a market? Is it because we don't have a cooking culture? I would like to leave this question open to the readers. 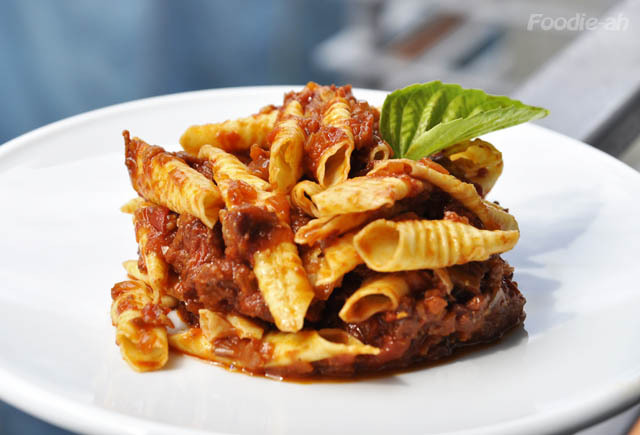 What can you do when you wake up late on a Sunday morning, you crave for good Italian food and you don't feel like going out to shop for groceries? You have to make do with what you have in the fridge. This is how sometimes hearty recipes come together, and it is certainly the case for this one: simple and tasty, can hardly go wrong. Cut the bacon in thin slices. In a large frying pan, heat some olive oil and fry the 2 cloves of garlic until golden, then add the bacon and fry it until almost crispy. 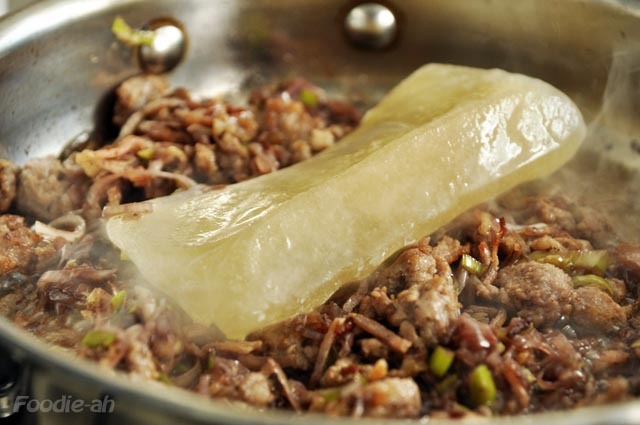 Finally add the meat of the sausages, which you must first extract from the thin wrap. 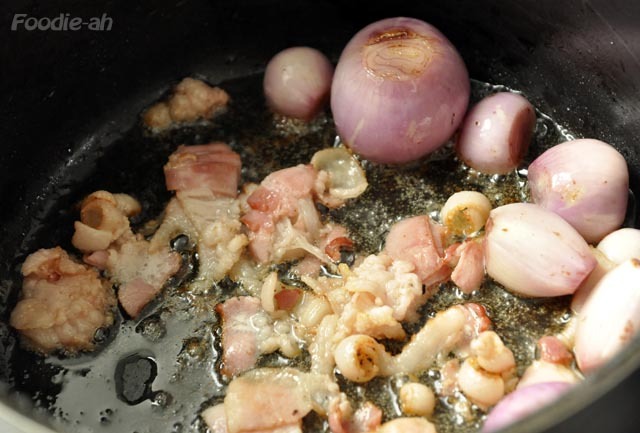 Fry the bacon and sausages until the meat is cooked throughout, then remove the meat from the pan and add the onions. Fry for a minute, then add the leeks. 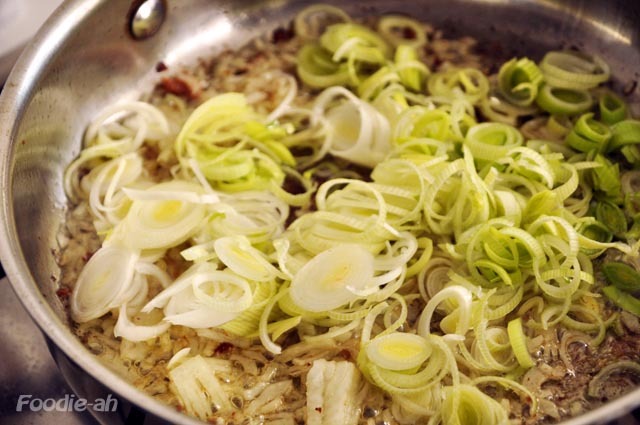 Once the leeks and onions are softened, deglaze the bottom of the pan with the red wine on high heat, and let evaporate for a couple of minutes. Finally, bring the heat down to medium and add the meat back into the pan. 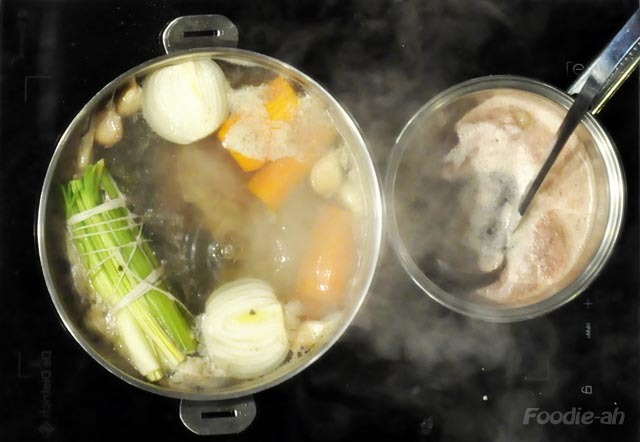 Top the sauce with 200ml of chicken stock (I use my own frozen chicken stock and let it melt naturally on the meat). Add the chopped tomatoes. 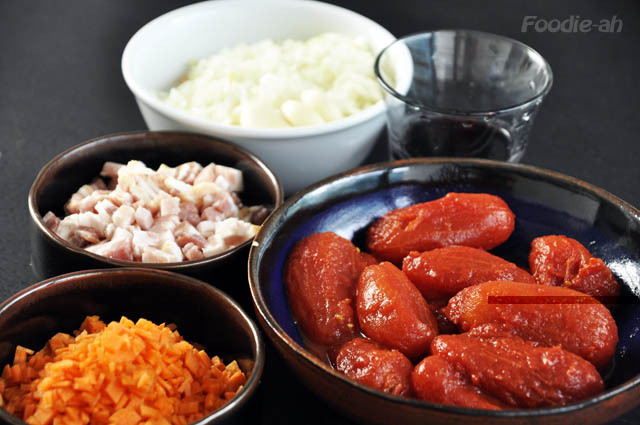 I use my magic oven roasted tomatoes, which add a lot of flavour without diluting the sauce. 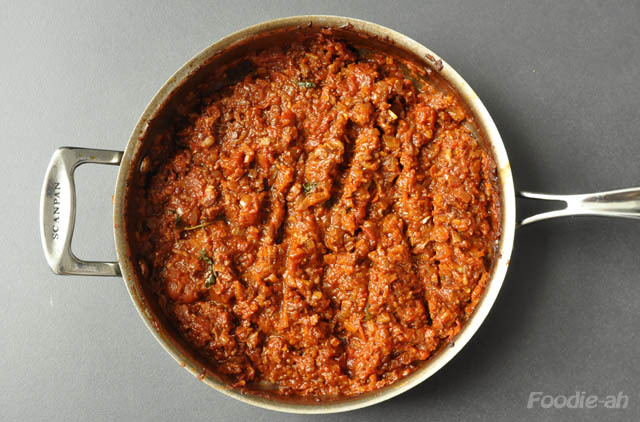 If you use canned plum tomatoes, I suggest you drain the water out of them for a couple of hours at least before use. Add the chopped chilli and rosemary leaves, and continue to reduce the sauce on a low simmer. 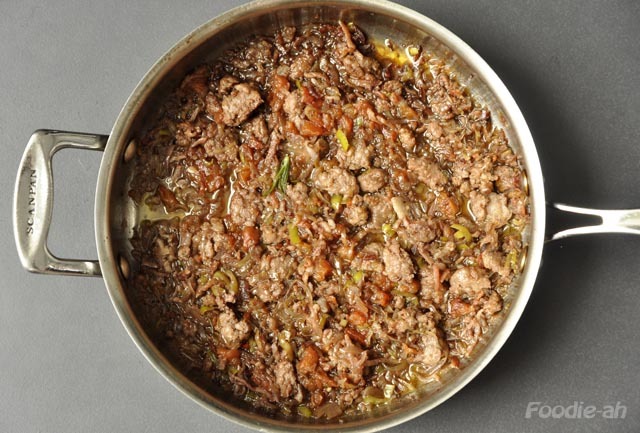 You will know when the sauce is ready when it looks like in the picture below. It should still retain some of its juices, but it must not be runny. I only added a very tiny pinch of salt, since the sausage and the bacon already did the job. I recommend you taste the sauce before adding any salt at all, since the result really depends on the saltiness of your sausages and bacon. 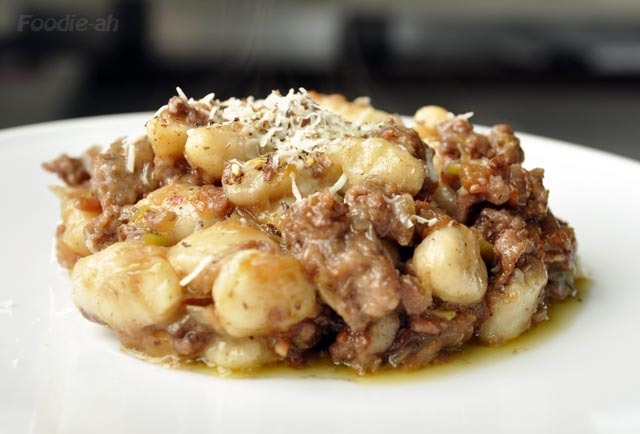 If you want to continue to simmer the sauce while cooking the gnocchi, just top it up now and then with some of the water from the gnocchi, and keep it going over low heat. Boil the gnocchi in a large saucepan until they resurface (this usually takes a couple of minutes), then drain them and gently mix them into the saucepan, paying extra care to not mash the gnocchi. 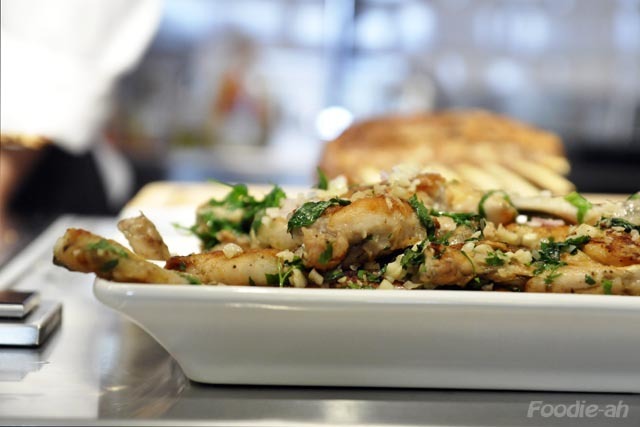 Serve them on a plate with some grated Parmesan cheese and a sprinkle of freshly grated black pepper. This is the fourth time I have eaten at this restaurant, although it's the first time I blog about it. Together with Cocotte, it is my favourite rustic French restaurant in Singapore. Located within a shop house, the dining room is divided in two floors and there is also a pleasant outdoor area for "al fresco" dining. Booking is recommended, given that the number of tables is limited. This is a small selection of dishes I have eaten last night, but really everything that's on the menu, is simple, rustic, good French food. I usually start with a duck rillette, which they can make very well. 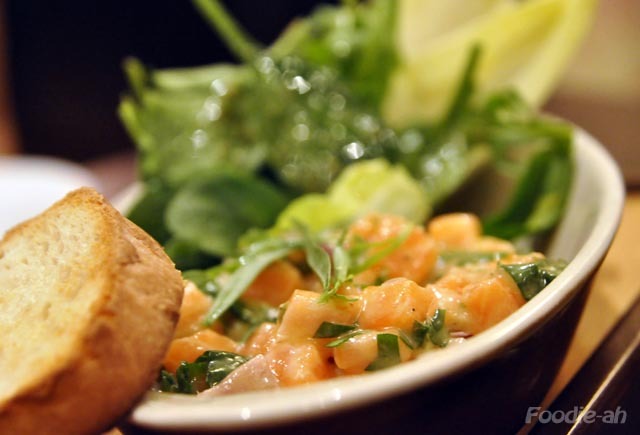 This time I decided to chose something different, and went for the salmon tartare, served with toasted bread. I was actually surprised by how good this was, and I will definitely have this again as a starter at my next visit. It is a simple dish, but the seasoning was so well balanced that it really worked. Now, onto the mains... the coq au vin, a true French classic, which was served with a side of tagliatelle. 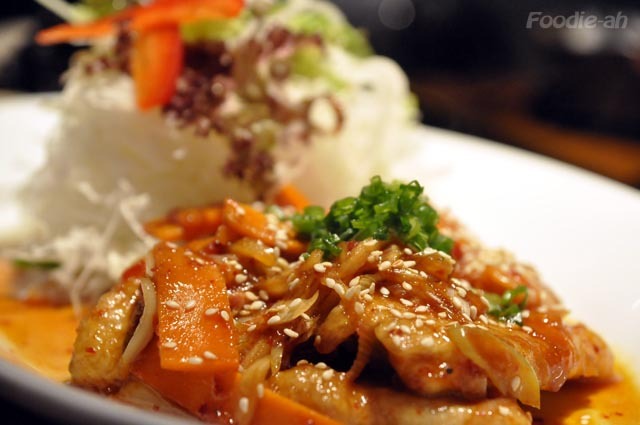 The sauce was packed with flavour, subtly smoky, and the chicken just broke apart, while still retaining its juices. The beef cheek braised with carrots and mushrooms was superb. 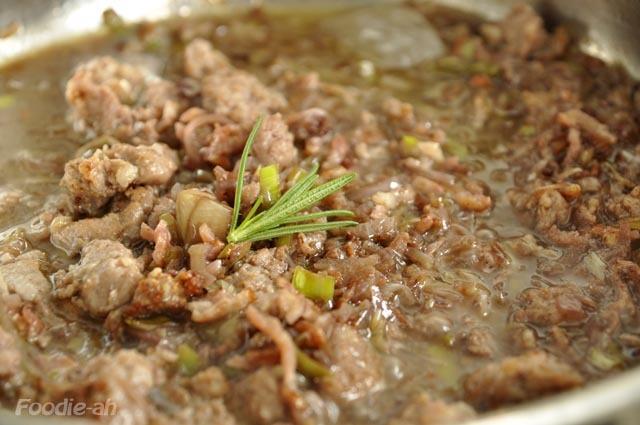 The generous chunks of beef were gelatinous to the touch, and the meat was incredibly tender and still retained some of its natural fat. 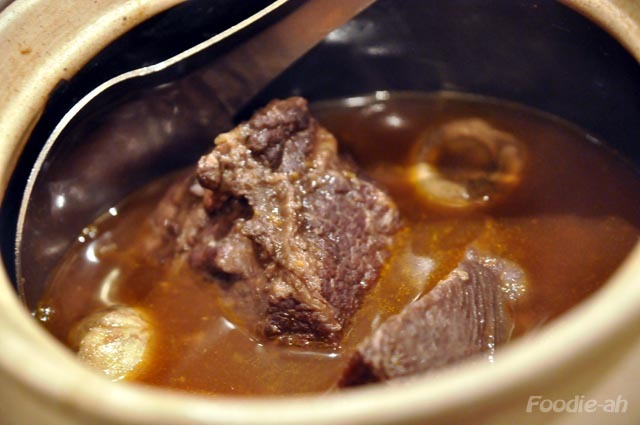 The chef managed to impress even a simple dish as boiled potatoes with parsley, which accompanied the braised beef cheeks. 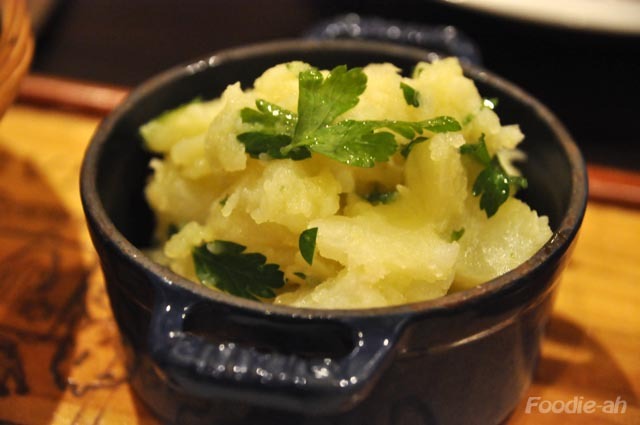 The distinct flavour of olive oil and parsley made this taste like as countryside food should. We sucked away any traces of the juices left on plates and pots with a basket of bread. The final bill was S$114, including two glasses of red wine. Le bistrot du sommelier is an obvious choice if you are looking for rustic french fare. I was delighted with every one of the dishes I have eaten at Le Bistrot du Sommelier at my previous visits, apart from their duck. My only warning is to vegetarians and fish lovers, since most of the menu is meat based, with only 1 fish dish.